PERSONAL STATEMENT: A graduate of the University of Denver, Terry Ehrlich majored in Political Science and Economics and received a Bachelor of Arts degree in 1980. She continued her education at the University of Denver and received a law degree in 1983. She was admitted to the Colorado Bar on October 31, 1983. She began her practice of law with a small law firm in Wheat Ridge, which practiced a wide variety of law, from domestic to criminal law. She took a leave of absence for 7 years to raise three children and began the practice of law again in 1994 with Arnold & Arnold, LLP. She became a partner in Arnold & Arnold in 2002. 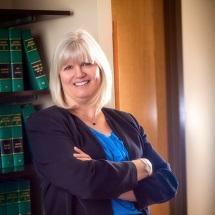 She now practices in the areas of collections, civil litigation, domestic, employment law and general commercial law. Terry believes that each of her clients deserves her time, attention, and best efforts. She works to meet the goals and objectives of her clients, without compromising her personal and professional ethics. She has been active in pro bono activities, volunteering for Metro Volunteer Lawyers, Denver Urban Ministries and Peacemaker Ministries.